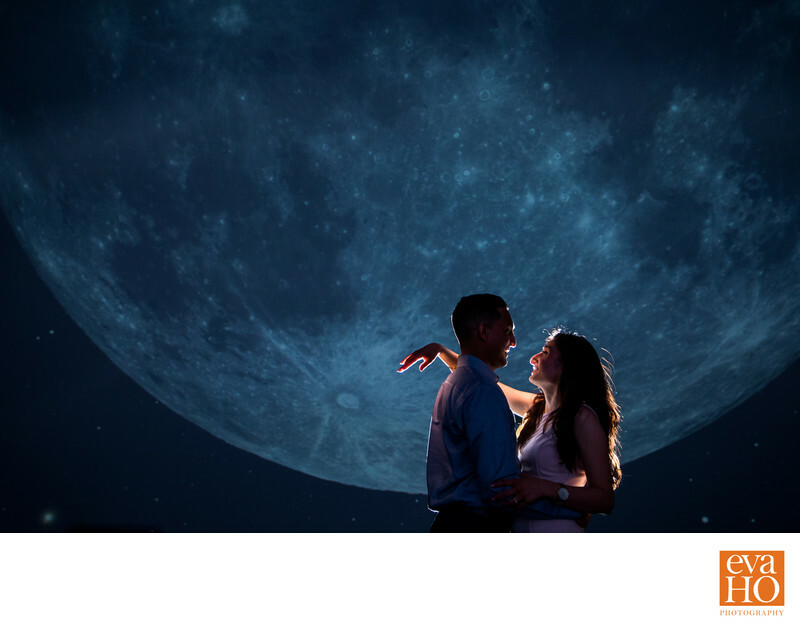 What could be sweeter than an Adler Planetarium surprise proposal? Today’s love story is about two people who grew up 2,000 miles apart. Bella grew up in Chicago and Anand in California. Despite the distance, they met and fell in love. Soon, Bella said goodbye to her friends and family and moved to southern California to be with the love of her life. Two months later, Anand showed her his commitment by asking for her hand in marriage inside her favorite museum in Chicago, in front of her friends and family. Anand and I came up with a plan to lure Bella to a “special event” at the Adler Planetarium. It wasn’t until she walked into the empty Grainger Sky Theater and Anand knelt down on one knee while John Legend’s All of Me was playing in the background, that she realized this was the moment they were going to commit to each other for the rest of their lives. Without any hesitation, Bella said yes. The two celebrated happily with a champagne toast and chocolate-covered strawberries. Just when she thought the surprise was over, Bella’s closest friends and family appeared behind her. Upon turning around and seeing her friends, she was overjoyed! What could be better than having everyone you love in one room? More photos on the blog. Location: 1300 S Lake Shore Dr., Chicago, IL .